The boat howitzer, with Redoubt VMI cadet for comparison. I am looking at doing a gun-sling (Google is your friend) and trying to calculate the wheel sizes. Many AFV models available now for 28 mm are 1/56th scale. I calculate 28mm (for a six foot or so man) closer to 1/64th. But since many use main-stream kits at 1/48th scale...So other than dizzy where does that leave us? I am not sure it really matters. Close enough is good enough. 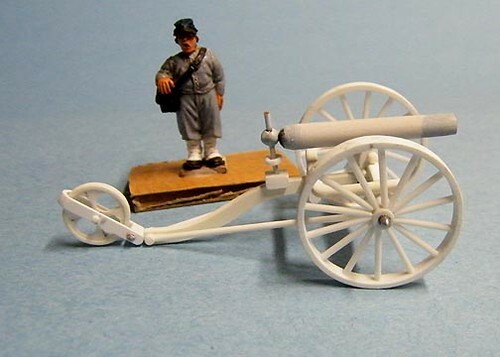 But having said that I am looking at doing some converted/scratch navy gunner types and maybe redoing the boat howitzer for limited production. In that case I will spend the Google-time to find some measurements and check the "scale". The wheels here are good, I think; the gun is a little long and too big. It will work with large 28s such as the Redoubt shown, but will dwarf my Dixon and especially my RAFM "true-25s" artillery. Looks a bit more to "scale" at this angle. 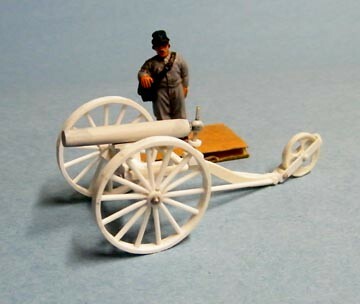 Wheels are good, but the gun and carriage are "heroic" scale for 28mm.